Heat two table spoons of oil in a frying pan. Fry peanuts, rai, jeera, chana dal, urad dal, dhaniya until golden brown (you feel a nice aroma). Remove the ingredients from the pan leaving the excess oil and keep them aside. Cut tomatoes into small pieces. Fry green chillies and tomatoes in the oil left over, until they are cooked. Let all the ingredients to cool. Then grind all the ingredients adding tamarind, salt (sugar if you like) and water into thick paste. For tempering heat one table spoon oil, add rai, red chillis, curry leaves and Hing. Let the rai crackle and add the thadka to the chutney. Yummy Phalli tomato chutney is ready. 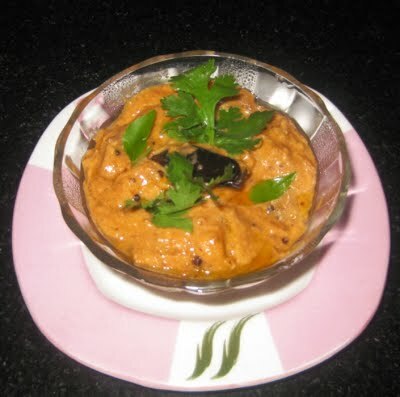 You can have this chutney with dosa, idly, chapati, roti, rice or any other snacks.